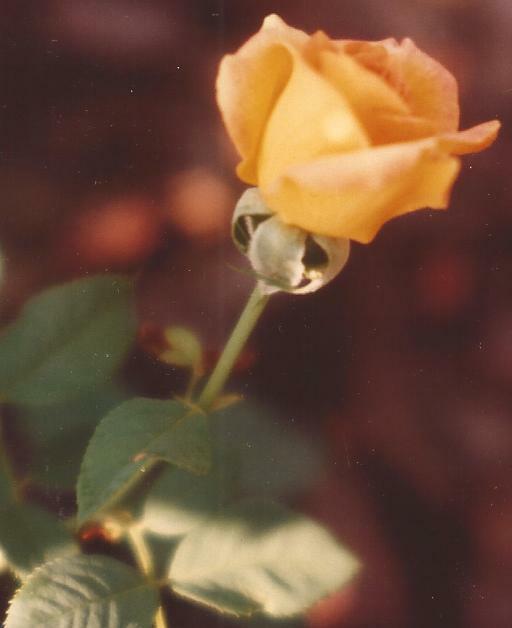 This photograph of a long ago rose was taken by Mama. 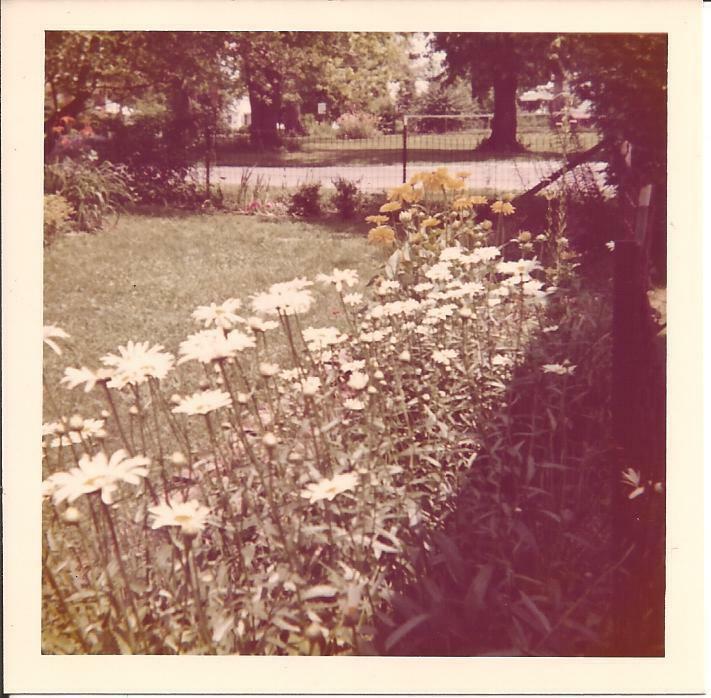 I scanned it from an old photograph in one of her albums of flower photos. She did not have where this picture was taken with the photograph, just the date of 1983. Mariette and Curt passed Simpson’s Grocery Store whenever they came over from Auto City to Carrollton Location to work. Mariette had noticed the store, as she had noticed everything about what was to be their new home. She planned to visit the store at her first opportunity when they finally moved to Carrollton Location, but there had been no opportunity for that yet. It was the night of that same April day after Mariette, Curt, Roy, Nettie, and Meaghn Louise had spent the day working on the Carrollton Location property, and the night of the same day that Jack Simpson had felt the darkness of Carrollton Location moving closer to his store. That night Mariette dreamed about the Dark Store. She had never been in the real store yet, but the store she saw in her dreams was the same store as the one in Old America. Later, when she visited the store for the first time, she would recognize it as the same one she had first seen in her dream. In this first dream of the Dark Store it was a dark November day. It was late afternoon, and night was coming early as it always does this time of year. She was walking down the deserted main street of the Nightmare City Without A Name. This time the Nightmare City Without A Name was Old America. The post office and the one gas station were closed and the houses all had a closed secretive look. Wind chased dry leaves down the empty street. Mariette could hear the leaves rustling. It was a dry sound like Mariette imagined the bones of old skeletons would make. A November sound. Mariette came to the old-fashioned grocery store. She had been planning to stop, but as she came closer she could see that the store had been out of business for a long time. The windows were boarded over and some of the faded bricks of the building were missing. The wind made a low moaning sound as it came around the corner of the building. It was the sound it makes after Halloween is over and winter’s real death, rather than the make believe death of Halloween, is just around the corner. Mariette shivered and pulled her thin denim jacket closer around herself. Mariette had the sudden impression that the store was really only a facade, that the whole town was made up of the false front buildings of a movie set. That night Simpson too dreamed of the Dark Store. In his dreams he saw a young girl wearing faded jeans walking down the main street of Old America. Her short blond hair was blowing in the wind, framing her face like a golden halo. Simpson caught just a glimpse of her face before he woke up. It was an angel’s face, but there was also something terrible in the purity and innocence of the girl’s face. Something Simpson couldn’t define. And that night Nettie shared the dream of the Dark Store also. She woke up in the dark lonely hours of the early morning and reached for the comfort of her sleeping husband beside her. It was a long time before she could go back to sleep again. She knew that the darkness was getting closer to her beloved daughter and that there wasn’t much time left to save her from whatever forces that Nettie now knew had been set in motion when Curt and Mariette bought the old house in Carrollton Location. In Auto City Miss Dunbar also dreamed of the Dark Store. She wasn’t sure what the dream meant, but she was sure that it was an ill omen of some kind. She pulled the covers up around herself, shivering as she heard Red howl. She couldn’t ever remember him howling like that before. That was an ill omen too, she was sure. Trouble was on the way and it was coming closer. And somewhere in the dark hours of the night, in faraway Libertyville, Thomas Frostman dreamed of the Dark Store. He woke up with the familiar feeling of unreality, of his whole life being just a facade, like the whole dream town of Old America was just a facade. He couldn’t sleep anymore that night. Although he had never been to Indiana, down in Paradise County Tennessee, Fred Woodby too saw the Dark Store in his dreams. Even more clearly than the store, though, Fred Woodby saw the blond girl walking down Main Street in Old America. He immediately recognized her. He could have told Jack Simpson what the expression on the girl’s face was. It was the same expression she’d had on her face when she’d looked at the Paradise River property he’d sold to her and her husband. The look of innocence on Mariette’s face was the same single minded innocent greed as a child has on her face when she looks at all the presents under a Christmas tree. And in the dark dilapidated house in Carrollton Location, it was November again and Simon dozed in front of the dying fire. In his dream he was walking on Main Street in Old America, walking to Simpson’s Grocery Store, as he used to so long ago when he was a young man and bought groceries there for Mother. In his dream Simon was young again and going to the store as he used to, long before Simpson delivered his groceries to him. Just ahead of him, always walking just a little too fast for him to catch up with her, he saw Mariette. Her blond hair was a halo of gold and he was sure she was an angel come down to earth for some reason. He knew that even if he could catch up with her, he would never dare speak to her. Sometime in the dark early hours of the morning, Simon woke up. The fire was out and it was very cold. He didn’t feel the cold, though. Simon himself wasn’t quite sure what he meant by this, but it was all right. Mariette would know. She was an angel, so of course she would know. And then everything would be all right for him and Mother both. Maybe even if Mariette brought enough of the past back, Marcia would marry him after all rather than leaving him to marry someone else the way she had all those long years ago. Then they could all live in Carrollton Location together again forever. Simon’s last thought before falling back to sleep was to wonder what Mariette wanted most of anything. If it was in his power he would give it to her in gratitude for what she was doing for him. What could you offer an angel, though? Mariette woke up for the third time that April night. She woke up from her nightmare of the Dark Store at the same time Simpson woke up from his dream of his own out of business store in Young America. That was the first night Mariette dreamed of the Dark Store, but it wouldn’t be the last. And the Dark Store, of course, was just another of the infinite manifestations of Nightmare House. Last month when I posted the first half of this chapter, Jack Simpson: The Dark Store, I mentioned that I would look through Mama's old photo books before posting the June blog, the second "nightmare part" of this chapter and that if I could find old photos of the actual store in Young America (called Old America in Mariette's story) I would publish them this month. I was unable to find any photos of the store, but have not looked through everything Mama has yet. If I find photos of the store later, Jack Simpson will have more chapters in the book, so I will publish them then. Mama also, besides having boxes and books of old photos, has boxes and boxes of old slides. There could be some photos of the store in there--they came up to visit Gain and me often. I haven't looked through the slides yet and don't know yet how to copy them. 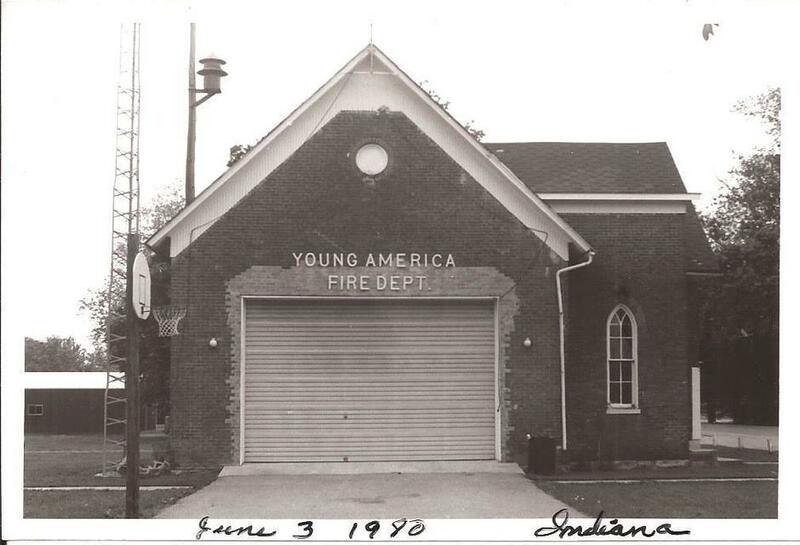 All I've found to publish this month is the Young America Fire Department photos. 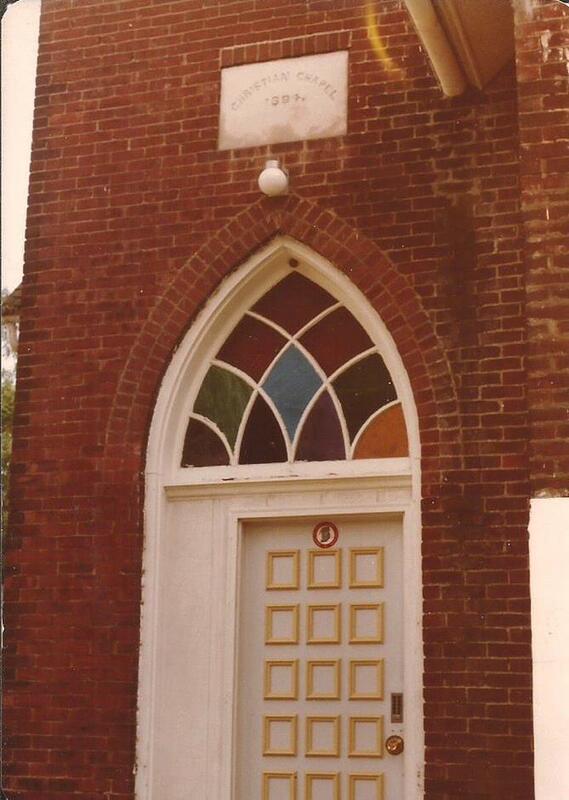 The fire department was originally a church. I don't know if Mama or Daddy took these photos, but Daddy almost always took black and white photos, which he developed himself. Mama usually took color pictures or slides. So he gets the credit for the black and white ones and she gets credit for the color ones. Later, when I get time, I will see if any of the historical societies would like copies of these photos, which I am slowly scanning. If anyone interested in history sees these photos and wants them for personal use or to archive, feel free to download them and share them however you like. 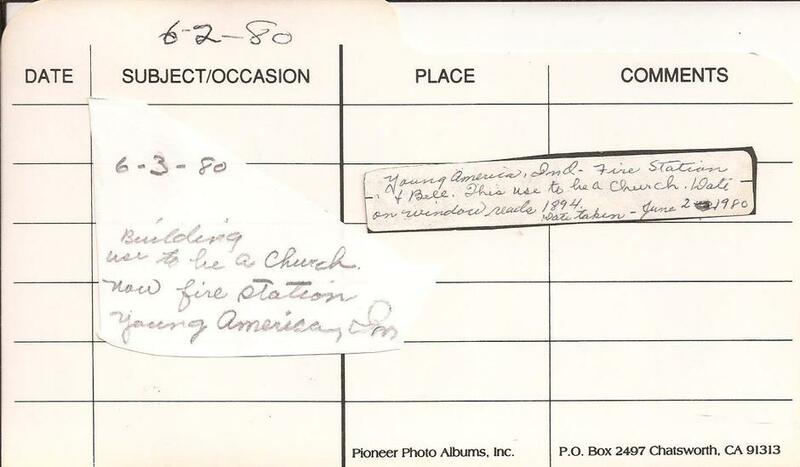 This is a photograph of a different church in Young America, not of the Young America fire station, but it was in an envelope with the fire station photos, all taken by Mama and Daddy on that visit to Gain and me. 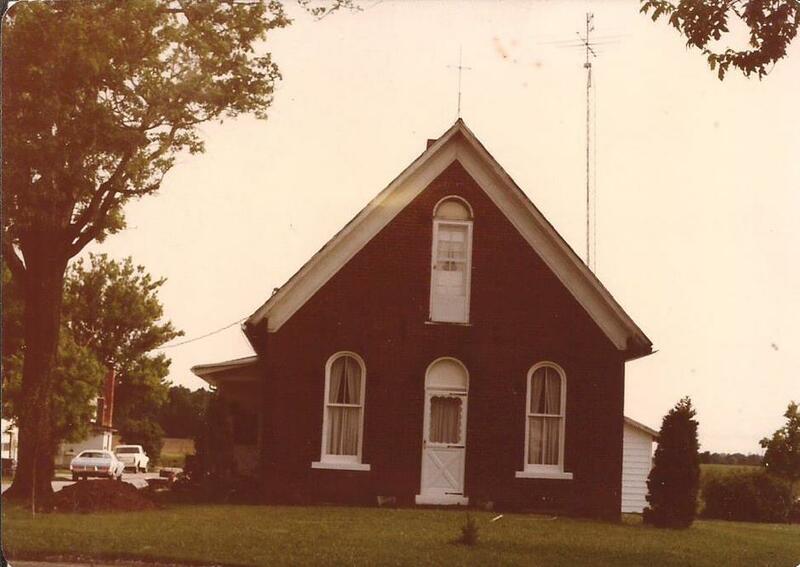 I remember there was an article in the Pharos-Tribune, the Logansport, Indiana newspaper at one time that a couple had bought an old church and were restoring it to turn it into their home. I am not sure exactly where the house was in Young America, or when the article was published. Whenever Mama and Daddy visited us, and when we visited them, we planned special things for us all to do during the visit. 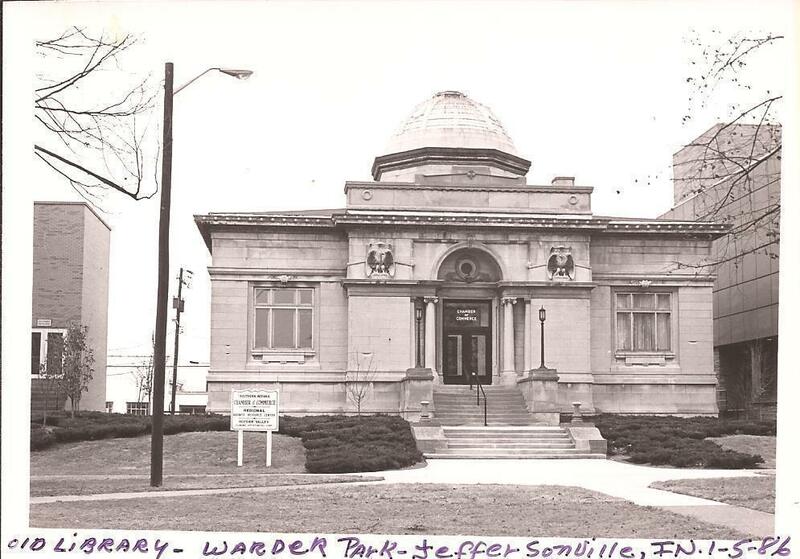 The article may have been published around that time, and so they may have, while they were getting photos of the church, wanted to also see the house. I don't know if the Pharos-Tribune would have anything in their archives about the article or would let anyone have copies of the article, but here is the link to the website for the Pharos-Tribune if you want to pursue this line of research further. I don't have time right now to pursue it myself, as I am still hoping to find out more about the old store in Young America. I was able to find out a very little about the store, and hope to continue that research more later before it is time to publish more of Jack Simpson's book chapters. The older history gets, of course, and especially when it is not very important except to a few people, the harder it gets to find out anything. 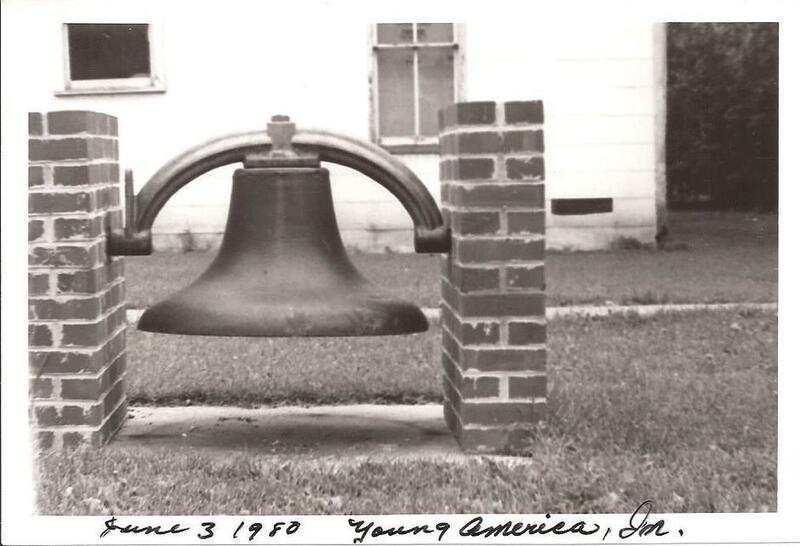 Young America is a tiny town in north central Indiana, cared about and known only to the local people. Once you get to the bigger city of Kokomo in Howard County and about 20 miles or so away, most of the people there haven't even heard of the many small towns in the neighboring county of Carroll County. And they really don't care, busy with trying to keep up with their own small lives. And to make old history even harder to discover, of course, is that as the old people die, leaving few if any records of their lives, and as the buildings are abandoned and eventually torn down, the new people have no memory of the town's past. Anyway, I will try to get back to the store research before Jack Simpson has more chapters in the book, but he will not have any more chapters for awhile, so perhaps I can find out more by then. I hope you enjoy the photos of the old fire station and the other converted historical church this month, though. Mama had this handwritten card in the envelope with the photos she and Daddy took in Young America that long ago visit to Gain and me. I scanned the photos and the card and carefully returned them to the envelope and the same place in the box of other photos where she had them. And here is the rest of the research I did on Young America. I published the first part of the research in last month's blog, but there was enough to break the article into two parts so that there would be some for this month, as the "Dark Store" chapter continues. Hope you enjoy reading all of the old history I found, and hope to find more to publish later. It is 12:08 P.M. now and at 1 o’clock, when it will probably be as warm as it will get today, I want to get out and dig up the bamboo bushes for transplanting. So will not work with the photos anymore now. From looking at the enlargement, though, I think the store may not be the same one I remember, but the other one that was no longer there when Gain and I lived in Wheeling. I will have to try to figure out how to enlarge the actual photos and maybe print them out to lay side by side to compare, and even then the old postcard is so faded I may not be able to be sure. But will do that later. Still time to do just a bit more research today. This book was listed first on the above search result. It is a book published in 1886 and scanned by the Internet Archive. I downloaded a PDF of the book to check later and to keep in my cloud library. I looked at the table of contents and since the book, although it is very long, is a history of all of Cass County for many years, it didn’t appear that there would be much if any detailed information about the Young America store. Here is the link to the book which is free to download. Everything on the Archive is free. Here is the link to the main Internet Archive website. They preserve old books, movies, about anything that is out of copyright and make it available free to read online or to download in various formats by anyone who has or has access to a computer. They are also preserving as many old websites, long gone, as they can. On the home page they have the “Wayback Machine”. If you have the address of an old website that is gone, you may be able to find it with the Wayback Machine. I was able to find Earon’s old website that way. I am not sure how many of his pages they were able to preserve before he died and the website was gone, but when I get time, I will go back and see, and publish the links to his website on his page on my website. The Internet Archive has a huge library and I sometimes go there to search and see what old obscure books I can find. If they weren’t preserving this historic information, a lot of it would be lost probably. You don’t have to have an account to download or read anything, but if you want to make an account with them it is free and all you need is an e-mail and password. Well, my research time is used up again for today. It is almost one o’clock this afternoon and I want to get a little work done in the yard before it gets too late. So will close for now and file this information before quitting. There is definitely going to be too much for one post already, so later I will decide how much to use in the May post and copy that part of the research for it, and also keep the main complete document to record more research on Young America as I get time to work on it. Sun is out now and it is a bit warmer, so set the plants I have started out to get a little sun. This article is from July 9, 1957 Kokomo Tribune newspaper. It was written by Joe Young. And finally, here is the link to the National page called USGenWeb project which can be searched for historical information for all states. I also bookmarked it for future use. I am going to close this project out for now, as I am having no luck finding specific information on the Young America store. 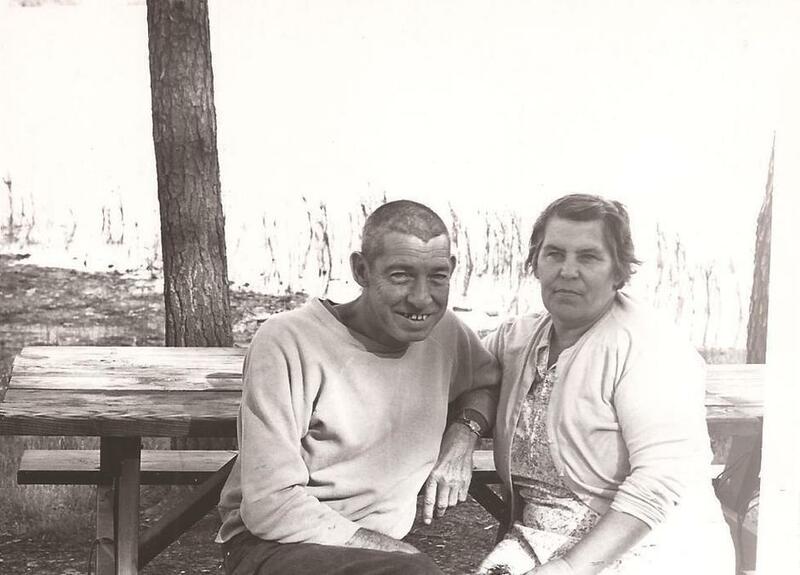 I will continue this research later and, hopefully, by the time it is time to publish future chapters of Jack Simpson’s story in Mariette’s book, perhaps I can have found out more. I have enough to publish for now, plenty for the May and June blogs both. So I will quit for now and get the flower research I want to publish done next. It will be easier to find, I am sure! So much is lost to time that historical information is very hard to find, I am learning! I had fun looking this up, though, and hope you enjoy reading what I’ve found out so far. I want to save some time also this leisurely Sunday afternoon for the Time Machine Room, and will look for old Young America photos that Mama and Daddy may have taken. I don’t remember them taking any or Gain or I taking any either. Film was expensive and scarce back then, before digital cameras, so we may have not taken any photos. I will continue to look, though, as I haven’t looked at nearly all of Mama’s old photos yet. If, later, I find any old Young America photos I will publish them. I never knew what these daisies were called. Mama always had them growing in the yard in the summer time. 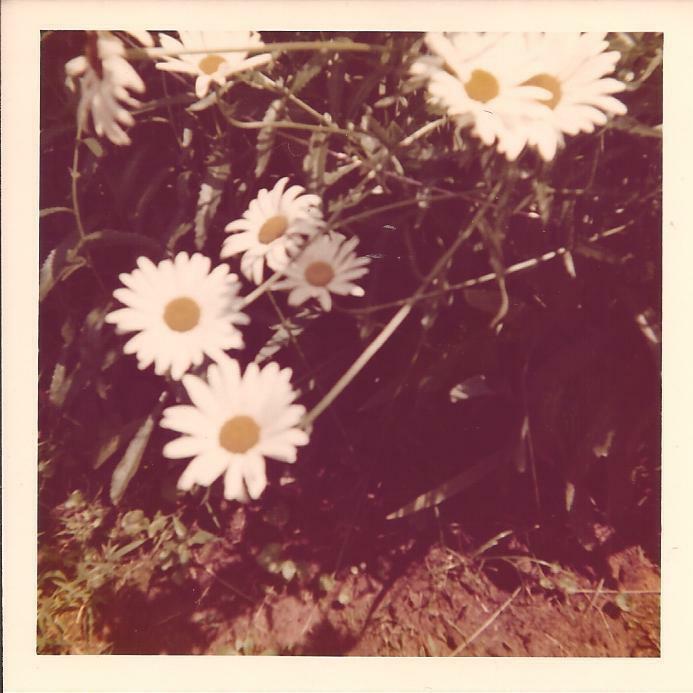 With the hot summer sun on their white petals, they looked as if they were made out of white porcelain to me, so I always called them "hard white daisies". Many of her flowers have survived for many years, but the hard white daisies are gone now. I tried to start seed from some that I think are probably what she had, but don't know yet if any of them will survive and bloom--the plants coming up where I planted them are too small to tell if they are the daisies or not yet. If they don't come up this year, I will try again next year. Found out later that I had an allergy not a cold. We left about 9:30 this morning for a camping trip to Spring Mill State Park. Things were not looking to good weather-wise and I have a lousy cold but we were packed and so decided to go anyway. I would not feel any better if we stayed home. Sleeping in our van is really neat. We have a rug on the floor and a foam mattress to sleep on. Lots warmer and better than sleeping in the tent. We stop at a rest park near Scottsburg, Ind. on I 65 N. Rode through a very bad storm for a few miles so the park was a welcome sight. The rain really came down while we were at the park and C.B. rested a bit while the rain slacked up and then it was time to move on. Arrived at Spring Mill and set up camp. 82 degrees so real nice weather-wise. Got a nice camp site. Small road with wooded area on one side, and lots of trees on the other two sides so we have a kinda private camp. C.B. cooked supper & I washed up the dishes. I spread quilts on the ground & C.B. sleeps. Come twilight and people begin to cook supper and have their camp fires lit. A nature slide about Birds of Prey was shown that night and one about Rocks. Really enjoyed it. Earlier we went to the Village and to Hammer Cave. Lots of water spilling from the cave and down the mill race for this time of year. Lovely little blue forget-me-nots grow thick along the creek by mill and even in the water along a small spring near an old spring house. I have some that bloom in spring. They look like these. It is peaceful at our camp. I hear the wind, like music in the hugh old tulip poplars and oaks above me. Very warm & cloudy—like another storm is on the way. I don’t care. It will be real neat to sleep in our van & hear the rain on its metal roof. Next morning—No storm but in the half light of dawn I hear a whippoorwill call close by. I get the recorder & record his call. Only one other time have I heard him. Once long time ago I climbed the fire tower at Clark forest with Harley. It was twilight-time--almost dark and we could see for miles out over the forest. We heard the call of the whippoorwill then. I shall never forget that special time when I heard him or now. Camp is coming awake now time for us to break camp & be on our way. All the creatures of the dark begin to stir. cry echoing over the land. Now they part and the moon shines through. Note by typist, Mary Hazel Upton: This diary entry is from Mama’s very old diary. The poem she titled “Twilight Time” is from her very old poetry book that she used to write poems in. Spring Mill State Park here in Indiana is not too far from where she and Daddy lived. It was one of their favorite places to go for picnics or to camp. It was possible for them to go there and return after a picnic the same day, but often they stayed overnight, camping in their tent, and later in their van. There is a lot to see at Spring Mill, including the old water powered mill where you can buy stone ground cornmeal, as well as the restored pioneer village and the caves. Daddy always cooked on his Coleman stove when they camped or also for picnics. C.B. 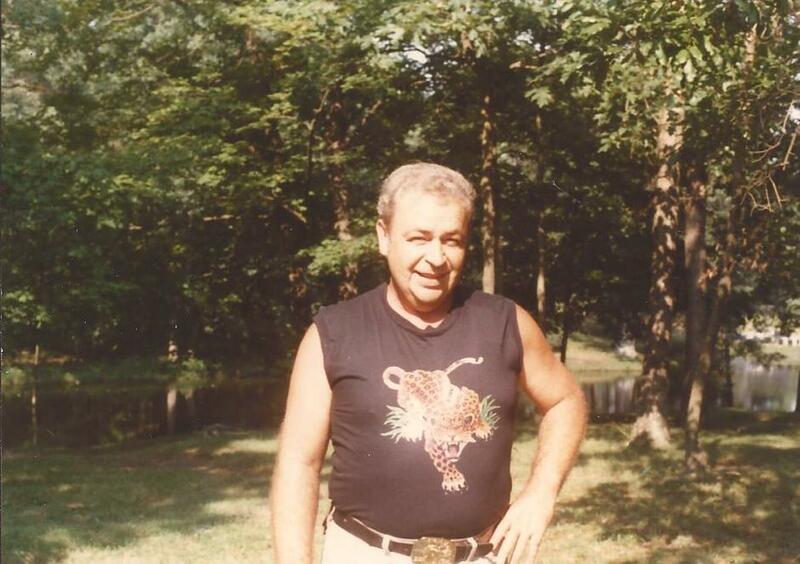 mentioned here is my Daddy, Claude. Harley is my cousin. I have typed this diary entry and poem exactly as Mama wrote it in her original diary and poetry book except for very minor punctuation corrections and paragraph spacing in the diary entry. I also corrected her spelling of whippoorwill, as I’m sure she would have wanted me to. I intentionally left her spelling of huge as “hugh” because that is how she always spelled it. I hope some one else will enjoy sharing Mama’s and Daddy’s long ago camping trip. I will be publishing more of her diaries and poems as I get time to type them up for her. I have not tried copying any of her many old cassette tapes yet, but my brother, Charles, gave me a program and player for the computer that he also gave me. This program and player can copy and digitize cassette tapes. So after I practice with some of the “store bought” music tapes she has, that could be replaced if necessary, I am going to eventually copy all of the handmade tapes. Mama never threw anything away, and so I am sure that the whippoorwill tape is among her other tapes in her Sewing Room where she also kept her photos and tapes. If I can find it I may be able to eventually digitize it for permanent preservation and to share. Here is a link to the website for Spring Mill State Park. It is one of the prettiest State Parks in Indiana. Hazel wants to know if July 16, 1986 would be O.K. for you to receive visitors. She means us .Let us know if it is unacceptable. I looked this up in the dictionary. The people mentioned in this letter are as follows.Gain is my husband. Hazel Henson is my mother. Claude Henson is my daddy. Charles Henson is my brother, and Anna Marie (also A.M.) is his wife. Additional note: The old computer I bought at the yard sale didn't work, so I will have to keep looking for one that still uses disks! Heat oil; add meat, and cook 5 minutes, stirring frequently. Add onion and celery; cook a few minutes longer. Add remaining ingredients except macaroni and cheese. Bring to boil; add macaroni and cheese; Stir. Cover and cook slowly 25 minutes or until macaroni is tender. Water may have to be added from time to time during cooking. 4 to 6 servings. Note: This is an old family recipe. I am not sure where Mama got it, but when I decided to include it with this mailing, I remembered that Mama had a copy of it somewhere. I almost have it memorized, but preferred having the original recipe, as I wasn’t sure. I remembered when I was sorting Mama’s things out, seeing it somewhere .I found a typed copy of the recipe in the pages of her Household Searchlight Cookbook in her “basement library”. Many of the recipes she used were from this very old cookbook that she had for years. I think she told me that she bought it from a door to door salesman, who was selling magazines. She bought a subscription to the magazine because they were giving away the free Household Searchlight Cookbook along with the magazine subscription. When I was a little girl, I thought all of her recipes were original recipes invented by her. Later, I saw many of the recipes in the cookbook, although she had changed some of them slightly. I will be sharing some of Mama’s recipes, that I remember her making, in the “News From Midway” letters from time to time, and possibly making a cookbook of hers and Gain’s family recipes. Additional note: I shared this recipe and others with family and friends in the "News From Midway" family Christmas newsletter I wrote for a few years. I also published this recipe on this blog on "Mariette's Magic Typewriter" page and it is still published there. I am publishing it here again in case some of you haven't seen it. It was a favorite family recipe that Mama cooked often and that Daddy sometimes cooked on picnics. 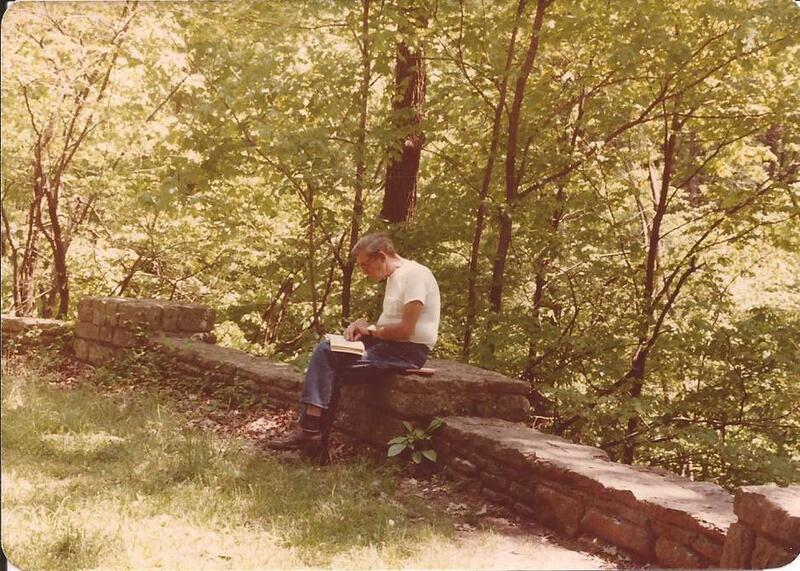 He usually cooked the picnic dinner on his Coleman stove. i just finished posting the last of the blog. It is after 1:30 P.M. now, though, and I still need to finish washing the last few dishes before walking over to the post office to pick up my mail, and then stopping by Kroger's to get a money order and to eat "dupper" (Gain's word for a meal too late for dinner, but too early for supper). The post office closes at 4:30 P.M. so I still have plenty of time, but not if I don't leave soon! I don't to want to leave the dishes, though, especially this close to finished. Nothing cancels out the luxury of eating out faster than not having to cook, but coming home to dishes to wash anyway! So I'd better close out the blog for now. If you read it before I get back to proof it later this evening, it is not finished. I will proof, check the links, and also add a bit more to the diary, especially about what is coming up next month in Mariette's book. I will also add one more flower photo at the end of the diary. I will, as always, post when the blog is considered finished so that you know it has been final proofed. It is early evening now, not 7 o'clock yet, so I should have plenty of time to finish the blog this evening. I will have to go out and water the plants before dark, but it won't be dark until nearly nine o'clock now. The days continue to lengthen up until the day after the Summer Solstice, and then right after the summer has just begun, it is already dying. Even then, though, the changes in the light won't be noticeable until late July, and then only a gradual darkening and shortening of the light earlier than just the month before. But by the end of July you know that the darkness is slowly, almost imperceptibly, but definitely winning the annual battle between the darkness and the light. I got everything posted except the rest of the diary and two more flower photos, one I took today, so decided to use two flower photos instead of just one to illustrate the diary. I also have to do the proofing, but if I haven't made many mistakes that should go fast. I worked a bit longer on the blog than I'd meant to this afternoon, but knew if I didn't get it mostly done before I left to walk to the post office and Kroger's that I would not get it finished today. It was somewhere between 2:15 P.M. and 2:20 P.M. when I finally left the house after I'd logged off of my website and quickly finished the dishes. After picking up my mail at the post office, buying a money order for AAA Auto Club dues and filling it out and mailing it at the post office, and then eating a leisurely supper at Kroger's, it was just almost 5 o'clock when I got home. Not bad. It would have probably taken me that long to take Van Boy instead of walking, by the time I'd gotten him out of the garage, hunted for parking places, and then had to put him back in the garage after I got home. I am walking as many places as I can now. When Mama and Hammerhead were alive, and I was transportation for them, I had to drive everywhere because they were both too old to walk far. But I can walk and there is no need to be wasting gas and helping destroy the environment for every little trip into town. And I enjoy walking. I walked into town along the old railroad tracks by Bell Avenue for as far as I could. After that, I have no choice but to use the sidewalks and, when I have to because there is no sidewalk, the street. But the old railroad tracks are a pleasant walk, away from the madhouse of traffic that never seems to stop and gets worse every year. The tracks were taken up several years ago, and I think the land still belongs to the railroad, but have not been able to find out if that is still private railroad land. I know the town started having someone with a bush hog mow it a few years ago. This year, when I walked on the path, I noticed they are still mowing the side by the road and have also poisoned the plants on the center strip. The are not destroying anything on the side away from Bell Avenue and next to Beechwood Manor so far this year. However, the plants are slowly coming back just a little on the center strip too. The wild things have patience and they can not be destroyed so easily. They were also talking about the town possibly buying this property from the railroad and making it into a walking and bicycle trail. I hope they don't if their idea of a "trail" is mowing everything in sight down and poisoning the rest. I am not sure who they think would want to walk on such a "trail". The articles in the paper awhile back stated that at first the railroad refused to sell the land, and that then they might have reconsidered and the trail could be made. However, except for periodic mowing and now poisoning the center strip, nothing has been done, so it is my opinion that this is still private railroad land that they have no authority to be doing anything to. 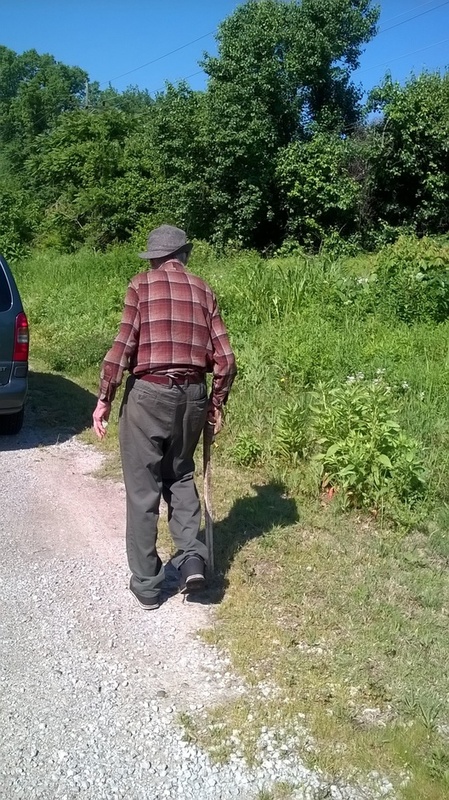 When Hammerhead and I used to walk there on what we called "Wilderness Days", which were always on Tuesday--each day I planned something special for him, some small outing that would not tax his energy too much--they were at first doing nothing to this piece of property and the wild things thrived and grew tall. Then a couple years ago they started outsourcing the mowing to a man with a bush hog who periodically, several times a year, destroyed everything down there. I know it was outsourced because the bush hog was unmarked and if the town had owned it there would have been the town logo on it. There wasn't. Then this year I saw for the first time that the plants had been poisoned in the center strip. So I figure maybe they are running out of money for all this stuff and things are starting to fall apart on them. If they had the money to continue having it mowed, there would be no need to poison the plants, which if any of the people who live near by found out, they would probably object. Who knows how deadly what they are using is? But the poison will last longer than the mowing, hopefully giving the wild things time to return and take back the land that was stolen from them. Be that as it may, for now I have the whole area pretty much to myself to enjoy. Most of the other people are in their cars on the main roads, not walking, and the people who are walking because they can't afford cars, are walking to the stores or to their jobs, not in the wild areas just to look for flowers like I do and like Hammerhead and I used to. And long before I knew Hammerhead, when I was a little girl, Mama and I used to go down there, when the railroad tracks were still there, to look for flowers for her to photograph and for us to gather wild fruit to make jelly and jam. When I walked there today I saw that the pink wild flowers that I took this photograph of a couple weeks ago are in more bloom down there now. They were there when Hammerhead and I used to go down there too. I think he said they were some kind of vetch. 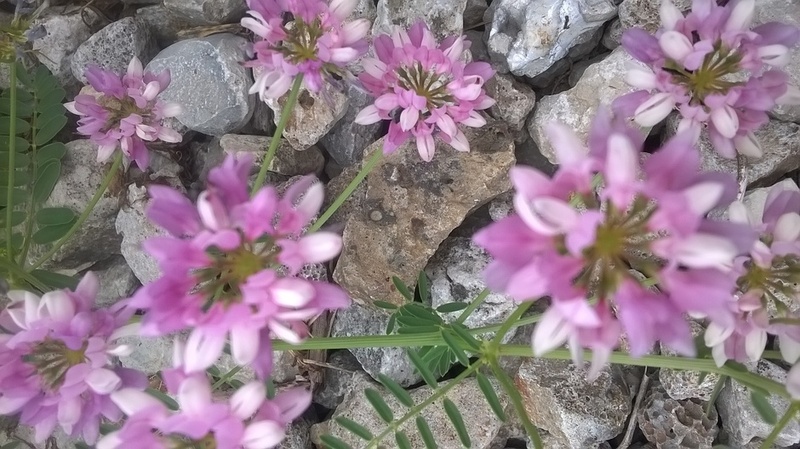 They have the same kind of leaves as the purple vetch that was also there. The purple vetch is already gone, seeding for next year. The wild sweet peas are blooming now, though, both pink and white ones. There is lots of pokeweed too and the mullein plants are coming back, lots of them. Trumpet vines are also blooming now, masses of orange red flowers on vines laying next to the path. There is a lot of Japanese hedge weed too. It looks similar to Queen Anne's Lace with its lacy white flowers, and although not as pretty as the Queen Anne's Lace, it is still very pretty too. There are huge clumps of elderberries in full bloom now also and hundreds of the baby Trees Of Heaven growing back after they bush hogged the big ones down. Trees Of Heaven are "weed" trees and thus practically indestructible also. I have noticed in my research that anything that grows easily and is pretty well indestructible is now classified as a "weed". And they have started a new classification now also. If they can't convince people it is a "weed", then suddenly they have a new classification called an "invasive species". In my research, when I was trying to find out what the Japanese hedge weeds were, they are considered an "invasive species". All of this, in my opinion, is part of the plan to convince people just to plant hard to grow delicate plants and flowers. Then when the plants die, of course, they can continue to sell replacements, and of course fertilizer and bug sprays that will be necessary to maintain the garden of these delicate plants. Just my opinion. After I picked up my mail, I stopped at Kroger's to eat supper. I had a spicy chicken sandwich since they appeared to be sold out of the chicken tenders I usually get (2 for myself and 1 to bring home as a bit extra for the cats in addition to their regular supper). I also had a large salad from the new salad bar and some peach iced tea, so I saved a little bit of the sandwich for the cats. I bought lemon cake to bring home for dessert later tonight. Also took time to look at a few magazines and also the flowers in the flower shop. I took a few photos of the flowers. Those were the only photos I took, though, at Kroger's, as the light was not right to take any of the wild flowers on Bell Avenue this afternoon. That's why I used the slightly blurred, but still pretty photo of the pink flowers I took a couple weeks ago. I wanted to post the photo of them, and that was all I had. Finally, I will wind up the diary with the information of what is coming up next month. I may have mentioned in a previous diary entry that the chapter "Moving Day" when Curt and Mariette finally move into their new home would be posted soon. After I reread that chapter, though, I realized that they had not moved yet, but were just shopping for and later moving the new mobile home onto the property. I am not sure why the chapter was originally titled "Moving Day". I changed it to "Almost Moving Day" and added more creepy parts for the other characters, which weren't in the original version. Simon, especially, becomes more real with each chapter and is getting a bigger and bigger part in the book. He is actually becoming a main character now rather than just an insubstantial ghost whose only purpose is to haunt the Old House. The time travel angle is starting to become clearer too. In the chapter "Almost Moving Day" scheduled to be posted next month in July, Simon is getting more and more excited about the young Rodgers couple moving to Carrollton Location. He is convinced now that when Mariette moves to Carrollton Location she is going to bring the past back for him. He now even thinks that he may be permitted to go back to that past and change some of his own history that didn't turn out as he'd hoped it would. And when that happens, he thinks that he, his mother, and the other people from his past, as well as Curt and Mariette, may be able to actually live in that past, the past that the Old House holds the key to, together forever. Mariette doesn't know anything about this yet, of course, but she still has the feeling that the old house's past is going to be hers and Curt's future. After "Almost Moving Day" the chapter after that will be of the actual move to Carrollton Location. It will be titled "Nettie, Roy, And Meaghn Louise Camp In The Old House And Simon Has His First Guests". I looked through my notebooks to see if I had that chapter written and maybe it could be moved to a new place in the book and be used. I did find a chapter, based on an actual camping trip that Mama and Daddy had in the Old House, but that was in September and I would have had to rewrite it to be in June, and change some things I really didn't want to. Also, the chapter was set in the time after Curt and Mariette had already moved to Carrollton Location and that would have had to be changed also. So I just left that chapter alone, and am writing a new chapter, which has to come before "Mariette's Haunted Office", which will be after that and is already written. I started writing it by hand in a new notebook, and it will also have to be typed, but I want to have a hard copy. I love Computer Boy, but I don't trust him. He can destroy a manuscript in an instant for any reason or no reason! He means well, but he isn't really very smart, not nearly as smart as he thinks he is! So I only trust hard copies. I think I can finish the new chapter in time for the August blog. If I can't, I have other manuscripts, short stories, articles, etc. that I can use instead. Hopefully, I will be able to post the new chapter on time in August, though. I don't have anything else of Mama's and Daddy's ready to use right now. so until I can get more of their writing typed up, they will not be able to be "guest bloggers" again for awhile. I hope you have enjoyed what I have posted of their writing, though, and will have more as soon as I can. Well, I'd better post the final photograph and close this blog out. Then, since it is already after eight o'clock, I'll take a break and water the baby plants. I have morning glories, pink plants (coleus), tomatoes, peppers, and passion flowers started now, and if I keep them watered I think they are going to grow. I will post news and photos of my plants later when I see what grows, but used up most of my space for gardening news with the Bell Avenue plants this month. Hope you enjoyed "sharing" my walk with me. I will post one last entry when I get this proofed to let you know it is finished. Hopefully, I can also do that tonight after I water the plants. It is after 10 o'clock now. 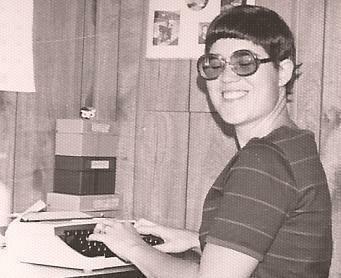 I've just proofed and corrected the manuscript copy of the blog. Since it is getting so late, and I am tired and could overlook mistakes, I'll proof the published blog and check the links tomorrow. So if you find mistakes tonight, the blog still isn't quite finished and I will post tomorrow when it is finished. I still have about an hour until bedtime left by staying up a little later than usual so will quit for tonight, eat my lemon cake from Kroger's, and have a little bit of Cell Phone Boy Storybook hour. It is almost a quarter after three this afternoon and the blog is officially finished for this month. All the links work fine. Hope you enjoy reading it. I worked until nearly ten thirty last night and got all but the final proof done, which I did this afternoon. Found a few mistakes this afternoon, which I corrected, and also looked up the links to Spring Mill State Park and Deam Lake. Got to eat my lemon cake last night, but was already too late for any Cell Phone Storybook Hour last night. Got to have hard copy Storybook Hour after I got back from walking to the post office yesterday. I am reading "It" by Stephen King now. Until next time. Thanks for reading my blog. Earlier this spring Kroger's had lots of lavender roses in various shades of lavender. This one was the only one they had today and I took several photos of it. 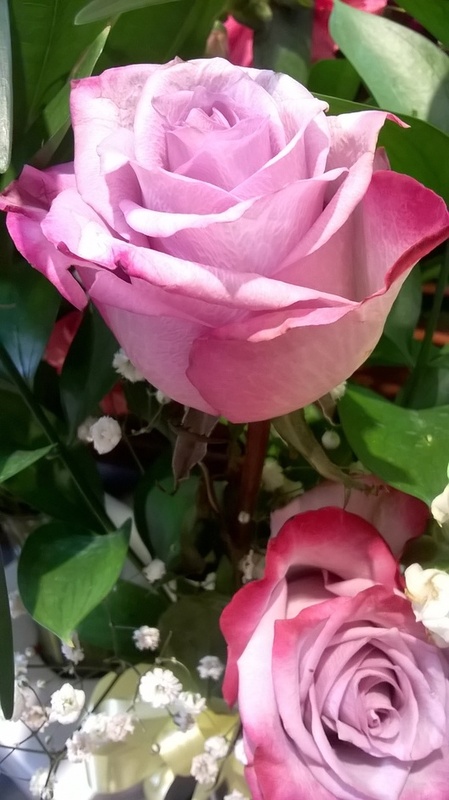 I also have photos of the other lavender roses they had before. A couple weeks ago they had red, white, and blue roses, all the colors on each rose. They had to have been dyed, but I sure would like to have a rose bush of real ones in those colors! I got some good photos of them too. I will post a photo of the red, white, and blue ones for next month for the Fourth Of July. They didn't have any more of the "patriotic" roses left today. I imagine they sold out fast. I don't know if they will get more in later for Fourth Of July or not, but I am glad I did not wait to get the photos of them. I was going to, figuring they'd have more later up until the Fourth Of July, but then decided I'd better get photos while I could. Everything comes and goes so fast and if you don't get it while it's in the stores, they may have moved on to something else!